On Saturday February 19, 2011 Vassula Ryden, Sami Carlos and myself departed from Athens on route to Dhaka, Bangladesh. 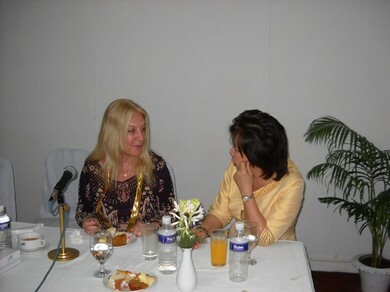 Albert and Valerie Mueller also joined us and we met in transit in Doha and we all flew to Dhaka together. We arrived at five am Sunday morning February 20, 2011. We were greeted by Duleep De.S.Gunesekere, who helps with the Beth Myriam in Dhaka, drove all of us to the lake Castle Hotel. We were informed that this day starts the ICC Cricket World Cup which Bangladesh is one of the three South Asian countries to host this event. On the way to the Hotel from the airport, you can see the beautiful and colorful decorations they have put up for this special event. 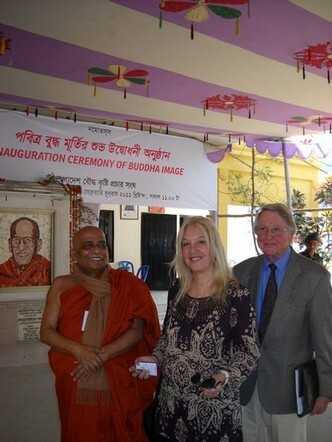 Shortly upon arrival at the Hotel, the President, Bangladesh Bouddha Kristi Prachar Sangha the Ven. 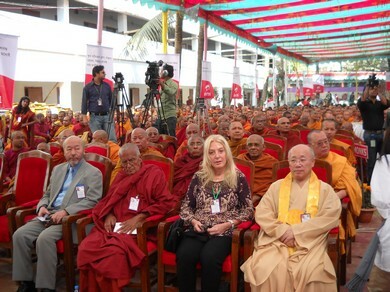 Suddhananda Mahathero, Sujit Kumar Barua, Buddhist, the Imam, Mohammed Mazharul Islam, Mr. Nirmal Kumar Chatterjee of the Hindu Inter-religious committee came to greet us. They all had come to the airport; unfortunately we missed each other so they came to our Hotel. They greeted Vassula with beautiful flowers and brought us flowers as well. 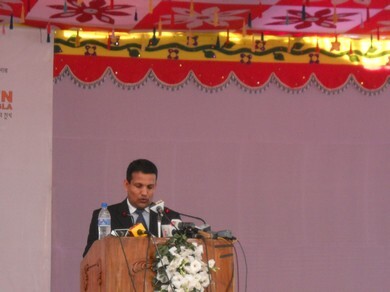 It was a pleasure to see them in their hometown of Dhaka. They have all joined us before on our Ecumenical Pilgrimages. It took me by surprise, that at five am in the morning, people would want to come to the airport. 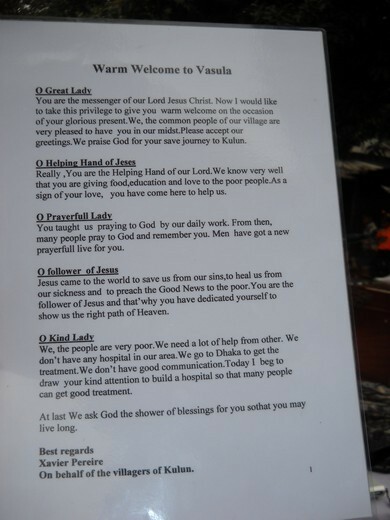 I was told that this is the Asian hospitality and they feel honored that Vassula has come back to their country. We then had breakfast all together at the Hotel. 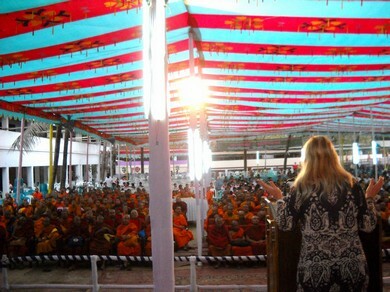 The invitation for Vassula to come back to Dhaka, was by the Venerable Suddhananda Mahathero. 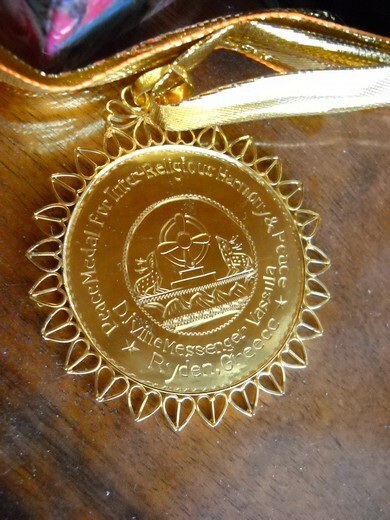 In His invitation to Vassula, he addresses her as "Divine Messenger, Sister Vassula Ryden, Divine Emissary of True Life in God". 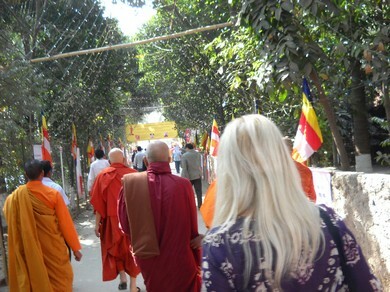 It was for The Grand Gala Inauguration Ceremony Of Buddha Image erected under the patronage of Royal Thai Family to be held on Wednesday February 23, 2011 at eleven am at Dharmarajika Buddhist Monastery Campus, Sabujbag, Dhaka Bangladesh. Her Excellency Sheikh Hasina Honorable Prime Minister Government of the People’s Republic of Bangladesh had kindly given her consent to grace the ceremony as Chief Guest and expecting that Honorable Ministers of Social Welfare Ministry, Religious Affairs Ministry, Cultural Affairs Ministry and Education Ministry will also be present as Special Guests. 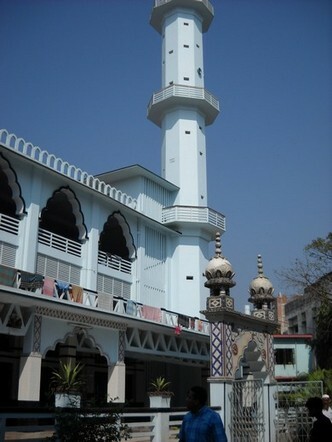 Once hearing Vassula will be in Dhaka, The Imam, Mohammed Mazharul Islam had written an invitation stating that it is his long cherished desire to bring her to his town of Mymensing to visit his Mosque and to meet with the Muslim Clerics. Vassula also added to the program to visit the Selesian Nuns at the convent in Mymensing as well as the Beth Myriam and the village of Kulun. On Sunday February 20, 2011, we rested after such a long flight and then we went to see the house at 27 Banani where Vassula and her family lived for three years in Bangladesh. Here is where it all began on November 28, 1985, the divine inspirations started and where Vassula’s guardian Angel Daniel visited her. A week before this mission, I had opened randomly the TLIG messages and I came on the dates of February 1995. I found it providential how we were all there on the same month as when Vassula was there in 1995 and received some messages in Bangladesh. In another message on February 18, 1995(Dhaka) and now, one question: do you still want to continue with all that I have given you and evangelise with love for Love? say: "yes, Lord, but with a fire inside me, with zeal for Your House and Your Glory;"
We then all continued and went to visit the Beth Myriam in Dhaka . The children of all ages were so patiently seated at the tables waiting for their lunch to be served. What impressed me right away was how disciplined they were and they all had such beautiful smiles on their faces. These children are so very poor and come from the neighboring slums. 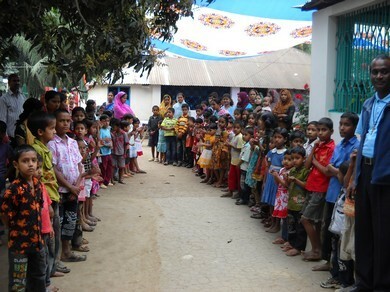 Vassula had asked one of the children in Bangla,” is it good “and the child nodded “yes”. 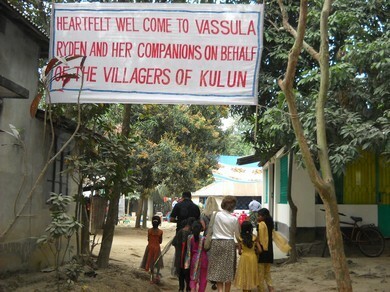 On Monday February 21, 2011 We departed after early after breakfast to visit the village of Kulun, a Christian village. We then went to see the True Life in God school in Kulun that was expanded in 2006. Alongside was the chapel of St. Joseph’s. 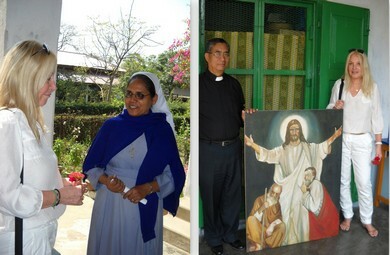 When Vassula lived in Bangladesh with her family in the 1980’s, her husband Per, and the family used to drive on the weekends and visit the Salesian Nuns and have lunch with them. In fact in 1987,Vassula gave them a large painting of hers and offered it to them. So we asked one of the Nuns if she could show us that painting. They brought it out for all of us to see. 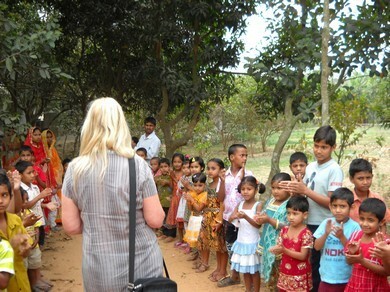 After lunch, we departed Mymensingh back for Dhaka as we had a four hour drive ahead of us. Blessed are the Peacemakers for they shall be called “Son’s of God” Jesus said to his disciples; be the light of the world do not be like salt that lost its taste For what use is salt if lost its taste? It shall be thrown away. Blessed are the meek in heart for theirs is the Kingdom of God. Be good and perfect as your Father in Heaven is perfect: So in the morning sew your seed of love, at noon sow your seed of peace, in the evening sow your seed of reconciliation, then go and collect your harvest and offer it to your Father in Heaven, and he shall tell you: In your graciousness my child you have obtained your reward in Heaven. The word of the lord…. 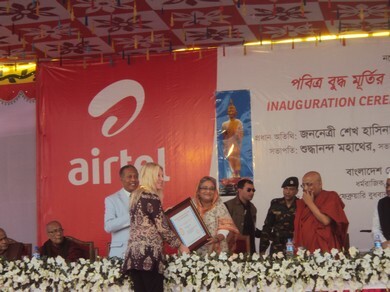 Her Excellency handed over the Atish Dipankar Peace Gold Award-2011 and Visuddhananda Mahathero Gold Award-2011 among the recipients for their contribution in spreading the message of peace. 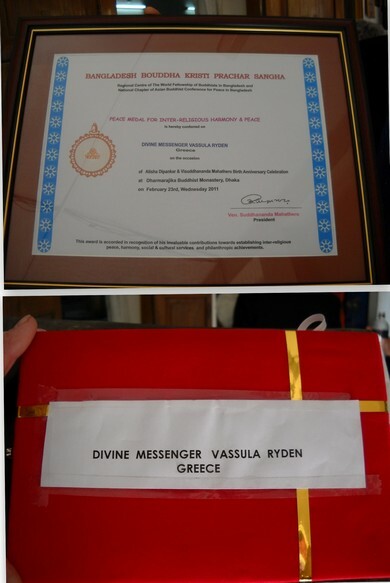 They announced her as Vassula Ryden, “Divine Messenger” from Greece. 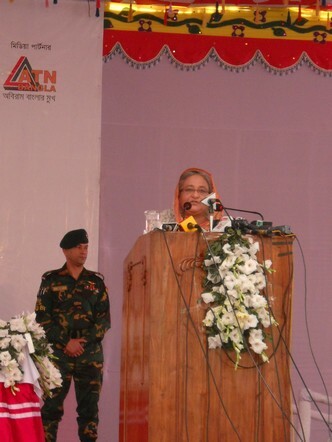 She was the first to be called to receive the Atish Dipankar Peace Gold Award Medal for Inter-Religious Harmony and Peace, where Her Excellency Sheikh Hasina placed it around her neck and awarded her the large plaque as well. 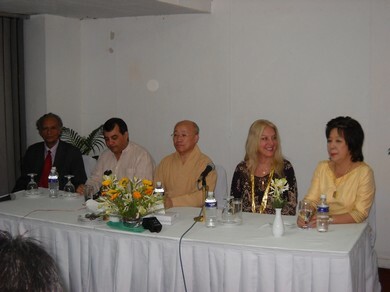 The Visuddhananda Mahathero Gold Award 2011 was given to T Y S Lama Gangchen, Founder Lama Ganchen World Peace Foundation, Italy, Thailand Police Major General Suwira Songmetta, Ajitananda Mahathero of Bangladesh, and Prof. Takahi Uemura of Japan, chair of Bangladesh-Japan Association of Science and Technology. 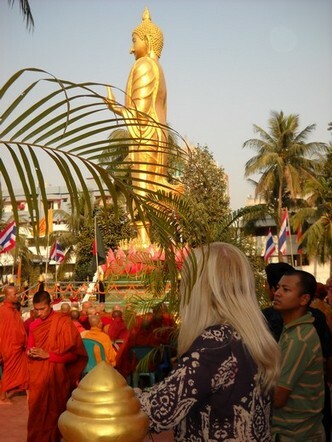 The Prime Minister departed and then we had a break for Lunch and the afternoon program began at four thirty in the afternoon with the ceremony of the Buddha Rupa. We then continued into the large meeting area for the reception of all the recipients. 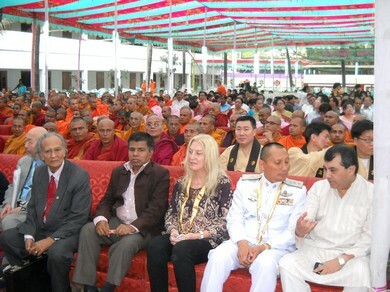 His Holiness Acting Sangharaja of Thailand Somdej Phra Wannarat remained present as Chief Guest. 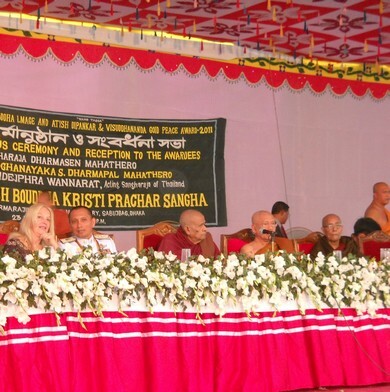 His Holiness Sanghanayaka of Bangladesh S.Dharmapal Mahathero formally inaugurated while His holiness Sangharaja of Bangladesh Dharmasen Mahahero presided over the function. Professor Dr. Pranab Kumar Baruya Secretary General who has joined us on our pilgrimages in Egypt 2002 and in Turkey 2007 greeted Vassula and gave her one of his books. 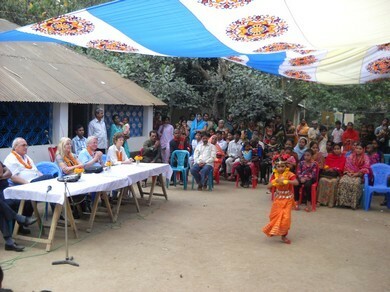 They invited Vassula Ryden, along with the other recipients to sit at the Dias that they prepared along with the other dignitaries. 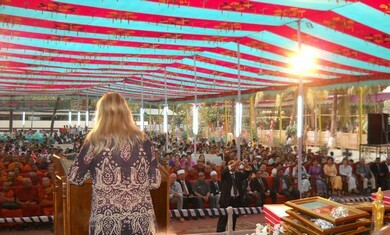 Again they announced Vassula Ryden, Divine Messenger from Greece, to go to the podium and address the people. Vassula went back to her seat where next to her was sitting Police Major General Suwira Songmeta. He congratulated her for her speech saying how much he liked it. He asked her if he could have and keep her speech. Vassula handed it to him immediately. 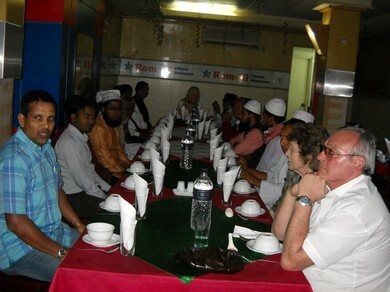 At the end of the program, around seven thirty in the evening, we were invited to a special dinner at the Hotel Dubani hosted by Mr. Saber Chowdhury M.P. for the recipients of the awards. 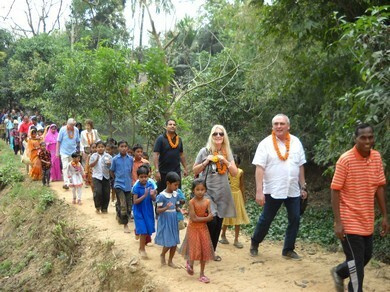 May God bless all of those people who worked on this program and during our visit with the people, we met wonderful people along the way, to make this a most memorable experience for me to witness, such warm hospitality and graciousness of the people in Bangladesh; Even though it is a poor country it is very rich in spirit!